Attorney elected to three terms in US Congress beginning in 1993, succeeding George E. Brown, Jr.. Not a candidate for re-election in 1998, instead running unsuccessfully for Governor of California, then re-elected to Congress six more times beginning in 2000. Resigned 2011 to become President of the Woodrow Wilson International Center for Scholars, succeeding Lee H. Hamilton. She was succeeded in Congress by Janice Hahn. 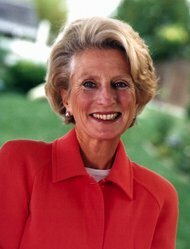 Her husband, electronics billionaire Sidney Harman, bought Newsweek in 2010, shortly before his death. Centrist "Blue Dog" Democrat; pro-abortion rights, pro-gay rights, pro-network neutrality. Supported 2001 USA PATRIOT Act, 2002 Iraq War resolution, 2004 restriction to bankruptcy rules, 2008 GM/Chrysler bailout, 2008 Wall Street bailout, 2009 economic stimulus, 2010 health care reform. Opposed 1993 North American Free Trade Agreement (NAFTA), 1998-99 Clinton impeachment, 2005 Central American Free Trade Agreement (CAFTA), 2006 Secure Fence Act. Behind the scenes, urged New York Times not to publish its 2004 expose on the Bush administration's warrantless wiretapping program.